This is my artwork influenced by the Grand Mosque in Abu Dhabi, because this depicts my mind landscape when I visited and study about the art of Grand Mosque. Firstly, the blue flower of each corner follows the technique of arabesque. This expresses Islam and Islamic Art. In addition, each flower has only 4 petals, which also expresses the cross of Christianity. Therefore, the blue flower shows the harmony of Islam and Christianity, that is, peace. Also, the color used, Blue, emphasizes this peace and tranquility. 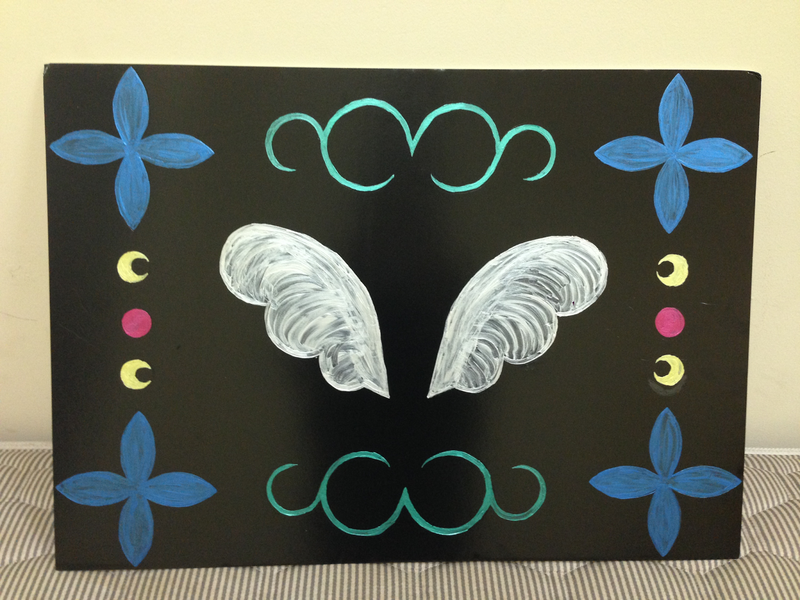 Secondly, the angel’s wing expresses the conversation with angel. The reason I painted is whenever I am praying I always feel that to pray is very similar to receiving the inspiration from angel just like the prophet’s revelation from Archangel Gabriel. This is the main point of prayer, so this is painted in the center. Thirdly, the green ivy on the upper and lower shows nature. The small red circle between moons shows sun. Therefore, the green ivy, moon, and sun represent nature and standing on earth. Finally, this painting is asymmetric. The asymmetry shows the respect to Islamic thought and art as well as nature and science. The black shows the universe, in addition, when praying we close our eyes. Therefore, this painting message (or concept) is that the prayer looks like the action lighting dark place. Through this painting, I would like to tell that the prayer is not asking God something but remembering God and ourselves with compassion and gratitude. This painting is exactly the landscape of my prayer with nature. Born in the countryside of Japan. Bred near the grandfather’s house, a local Japanese temple. Love religious art.